※Click on the question to see the answer. 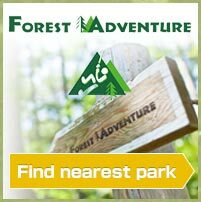 What is "FOREST ADVENTURE" ? "Forest Adventure" is a high ropes course through the forest – the idea was born in France. Participants can enjoy a unique experience – climbing up trees, crossing bridges at height, and then sliding down zip-slides to the ground – all in a harmonious natural setting. What are the different parks? Please contact the park you are interested in. You can find contact details on the “park info" page. Reservation is recommended. We do not charge cancellations. To make a reservation please contact us by phone or e-mail. There is a risk of falling from height, but if you follow the safety rules you will be safe. Participants go around the course at their own risk. Also, children under 18 years old must be accompanied by participating adults. Please follow our safety rules and enjoy your trip! Who can come to Forest Adventure? Children who are under 18 years old must be accompanied by participating adults. An adult can take 2 to 3 children. Please contact each park. Maximum weight is 130kg. Please check the information for your chosen park. Do the staff stay with me? Participants will go round the course by themselves. An instructor will give you the safety briefing and people who understand the safety rules can go round. Our instructors patrol the park. Course length varies, please contact the individual park. You can bring a camera, but we are not responsible for any damage or loss. We recommend wearing something you don’t mind getting dirty or even slightly damaged. Also, prepare for the weather. Please wear appropriate footwear with soles with good grips. No sandals or slip-off shoes. Ankle supporting boots are best. Some people recommend fingerless gloves. Long hair must be tied back. Body piercings should be removed or taped over and midriffs should not be bare as harnesses may chafe. The course remains open in all weathers, except when it is icy, stormy or during lightning. Sometimes we may close due to sudden changes in the weather. I am not strong enough. You can enjoy the course at your own pace. Sometimes you will see resting-places between activities. I want to be an instructor! Great! Please contact the park directly by email or phone. At what time do I need to arrive? What happens if I am late? Your booking time is the start time for your safety briefing, so you should aim to arrive 20 minutes beforehand to allow enough time to sign in and get ready. If you are late we will do our best to fit you into a later time-slot. However this might mean you have to wait, and it may not always be possible – especially if your booking is late in the day or if the park is very busy. It is sometimes helpful if you are able to call the park and let us know if you are going to be late. What is the maximum number of people per safety briefing? I want to bring a large group! Safety briefings start every half-hour, and we can take up to fifteen people per briefing. However, depending on how busy the course is we are sometimes able to accommodate larger groups – please call the park to find out if this is possible.